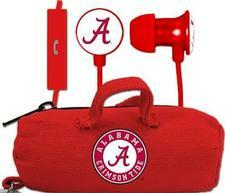 NCAA Scorch Earbuds + Mic with Budbag - $24.99 - GolfersEdgeOnline.com - Best Golf Equipment On The Web! Unleash dynamic sound when you plug in and rock out. Air Force Falcons Scorch earbuds are designed to deliver rich sound and deep bass. The inline microphone lets you switch between music and calls with ease. Stay connected on-the-go! Each pair of Scorch earbuds comes with a free Air Force Falcons branded earbud bag from BudBags. If you have any more questions about the NCAA Scorch Earbuds + Mic with Budbag; do not see the model you are looking for; need custom options; or prefer to not purchase online, then please call us at (630) 656-1291.